Brand new on the charter market, the 49m motor yacht Nassima is available through Jamie Wallace at HMY Yachts in the Caribbean this winter. Delivered just months ago by Acico Yachts, Nassima accommodates 12 guests in a bridge deck master suite, full-beam VIP stateroom and four twin cabins on the lower deck. Forward on the lower deck are crew quarters for seven and a self-contained galley. Captain Charlie Johnson leads a team of dedicated crew and, importantly, the yacht has zero speed stabilisers. 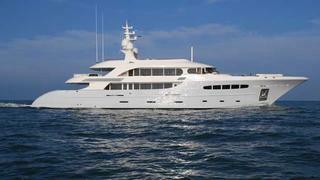 Nassima is available at weekly rates starting from $250,000 in high season and $200,000 in low season.